Choice of Equipment: Installing this was an out and out luxury mainly prompted by my use of Seatern for sometimes sleeping in when she is at the jetty. It allowed milk to be kept on the boat all the time, and it also served as a larder. At the jetty it worked off the mains; when that was unavailable it automatically switched to the 12V supply and uses about 1 to 4A when cooling (which is quite frequent). That might be acceptable on short trips but on longer trips it would just have to act as an insulated box. With that in mind I added some extra insulation to the sides. It sat in the port “V berth storage locker”. In Use: It was quiet in use except when started from warm on mains supply when it uses a boost cooling mode to get down to temperature. Overall I decided it was not a good purchase, and that a small compressor fridge would have been better. It used a lot of power and was not particularly cold – nowhere near what the manufacturers suggest. I had chosen this because it was lighter in weight. 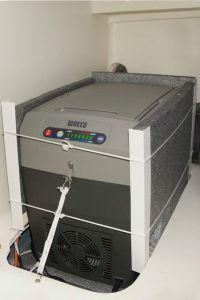 Choice of Equipment: Having saved weight in Seatern by using a lighter dinghy and a single battery, I decided to swap the cool box for a compressor fridge. This serves the same purpose, is heavier (12.5 kg versus 6 kg) but uses much less power (around 15 to 20 Ah/day compared to about 90Ah/day), and can maintain a colder temperature independent of the ambient value. The extra weight is more than offset by getting rid of one battery. It is similar in size to the cool box (slightly narrower and slightly longer) and sits in the same place in the boat. In Use: It is quieter than the cool box. PBO criticised these fridges for having the controls at the back – however it makes sense since once set it is better that they are in a position where they will not be changed by accident. Even so I have knocked them by accident and have now fitted bars to stop them being moved. The lid is removable which is annoying since it tends to come off if accessing the fridge in rough weather.